1.-HD optical aspheric lens,42mm diameter,up to 98% light transmission rate, 110 degree FOV(field of viewing); Pupil distance and diopter adjustment supported. 2.-It is a great supplement and extending device of the network set-top box and bring you wonderful experience of watching movies. Offers you super 3D picture effect and wonderful feeling. 3.-Simulating Viewing Distance: Offer you a 1000 inches big screen at the distance of 3m. You will not feel visual fatigue and dizzy even you use it for a long time because of the resin lens. Equipped with the anti-blue ray glass to protect your eyes. 4.- Side-push way to protect and fix your phones. It is very easy to push in and pull out the devices, which definitely will bring you much convenience. 5.- Comfortably enjoy a private visual feast, allowing you watch at anytime anywhere whether sitting, lying or standing as you like, and it is also a great companion for travel because of the lightweight design. 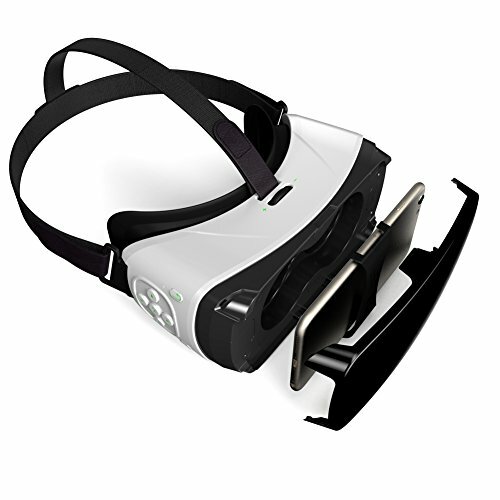 1) Revolutionary tech: Turn your smartphone into a virtual reality viewer. You can experience the immersive, fun and exciting world of VR. V.one VR001 is built with high quality ABS and 42mm diameter spherical resin lens material, it can minimize the distortion when magnifying the images and providing wider view. 2) T-shaped headband: This adjustable T-shaped strap is made of lightweight material, which can decrease the pressure around your eyes and on your head, providing you more comfortable feeling. This Flexible and adjustable headband is suitable for different people. 3) Amazing design: It is perfect for people with myopia under 600 degrees and hyperopia under 200 degree. You can get free from your glasses while enjoy the 3D movies or games with the virtual reality glasses, bringing you better experience. 4) Adjustable pupil distance and object distance: It is designed to satisfy different groups of people. You can slightly adjust the position of the spherical resin lens through moving the button on the top of the 3D VR GLASSES so as to get a better experience of watching movies. You can get a 110 degrees viewing angle. 5) Compatible with iPhone &Android series cellphone(screen size between 4.5 and 5.5 inches). More than 300 virtual reality apps on Apple App Store and Google Play Store for you download to enjoy shocking 3D effect. If you have any questions about this product by V.one, contact us by completing and submitting the form below. If you are looking for a specif part number, please include it with your message.